My beloved brothers and sisters, Aloha. I rejoice with you on this special day. Sister Bednar and I have loved watching you happy graduates and grateful family members celebrate a truly important accomplishment. Cameras are clicking, text messages and tweets are flying, and smiles are beaming all over this campus. This is a day both for remembering and for making memories. I recall with fondness the day I graduated from Brigham Young University with my undergraduate degree. Susan and I were just a few days away from the birth of our first child. I was about to begin work on a master’s degree. We were really poor, and together we looked forward with anticipation to the opportunities and challenges of the future. That graduation day for us marked a beginning rather than a conclusion. 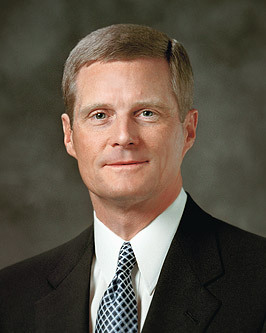 And as Sister Bednar and I review our lives and look back on that important day, we recognize and acknowledge the guiding hand and tender mercies of the Lord. Over the course of my life, I have participated in commencement ceremonies as a student, as a friend, as a professor, as a parent, as a university president, as a member of the Church Educational System board of trustees, and as a spectator. I frankly cannot recall precisely how many commencements I have attended, but it is indeed a very large number. And I readily admit that I genuinely enjoy commencement day on a university campus. My experience in commencement ceremonies has taught me a valuable lesson: graduates and their families care little about and rarely remember anything a commencement speaker says. I certainly believe that truth applies here today. My graduation gift to you is a shorter-than-you-probably-expect commencement message that focuses upon a simple and profound principle—a principle I will introduce by relating a true story from the American Civil war. Stonewall Jackson was a general in the Confederate Army during the American Civil War. Many military historians consider General Jackson to be one of the most gifted tactical commanders in U.S. history. As a young man he fought in the Mexican American war, and during the Civil War he served with General Robert E. Lee and commanded confederate troops in a number of key battles with Union forces. Stonewall responded to the words, “I fear,” in his colleague’s observation with a penetrating truth that ultimately became the general’s trademark: “Never take counsel from your fears” (Mary Anna Jackson, Memoirs of “Stonewall” Jackson, 1895, 264). That is the simple principle I want to discuss with you today: never taking counsel from your fears. “The world is spiraling downward at an ever-quickening pace. I am sorry to tell you that it will not get better. “I know of nothing in the history of the Church or in the history of the world to compare with our present circumstances. Nothing happened in Sodom and Gomorrah which exceeds in wickedness and depravity that which surrounds us now. Words of profanity, vulgarity, and blasphemy are heard everywhere. Unspeakable wickedness and perversion were once hidden in dark places; now they are in the open, even accorded legal protection. At Sodom and Gomorrah these things were localized. Now they are spread across the world, and they are among us” (Boyd K. Packer, “The One Pure Defense,” Address to CES Religious Educators, 6 February 2004, Salt Lake Tabernacle). As we consider so many of the things that are occurring all around us today, we could perhaps find ample reasons to be afraid, to hesitate, and to wonder if things in our lives can indeed turn out the way we have long hoped they would turn out. As you now prepare to go forth from BYU-Hawaii to work and to serve and to learn, some of you may question or lack confidence in your own ability to succeed temporally and spiritually. Or perhaps you wonder if the Lord’s promises of support and guidance—which you readily recognize and acknowledge in the lives of so many other people—will likewise be evident in your life. You may be uncertain about pursuing an opportunity because you cannot foresee all of the details about how things will work out, and thus you are reticent to start and take the first steps on that path. Or you may be so concerned about making a mistake that you fail to act in faith and press forward, and you thereby increase the likelihood of the very failure you fear. To not take counsel from our fears simply means that we do not permit fear and uncertainty to determine our course in life, to affect negatively our attitudes and behavior, to influence improperly our important decisions, or to divert or distract us from all in this world that is virtuous, lovely, or of good report. To not take counsel from our fears means that faith in the Lord Jesus Christ overrules our fears and that we press forward with a steadfastness in Him. To not take counsel from our fears means that we trust in God’s guidance, assurance, and timing in our lives. I promise each of us can and will be blessed with direction, protection, and lasting joy as we learn to not take counsel from our fears. As we exercise faith in Christ and trust in His promises, we can walk into the dark with the absolute assurance that our pathway will be illuminated—at least far enough to take the next step—and then the next step—and the next step. One of the great lessons of my life came as I served as the president of BYU–Idaho and faced significant challenges and obstacles during the transition of Ricks College into a four-year university. I recall listening to President Hinckley on several occasions counsel doubters, cynics, and critics that “everything will work out.” And he was right. Everything worked out—even though we did not know at the time all of the details and specifics. One of the leaders of the Church once related to a group of religion instructors that not long after he had been called as a general authority someone planted a bomb at the door of the Salt Lake Temple. The bomb had exploded and knocked the large, heavy door off its hinges. He commented that the episode was chilling to him and created an anxiety and discomfort, even a fear that lasted all day. To his utter surprise, he noticed that all through the day, in the many meetings he attended with other General Authorities, no mention was made of this scary incident. Finally, at the end of the day, he asked one of the senior Brethren about the temple door, only to have his colleague remark, “Yes, we need to get that fixed, don’t we.” Then he added this important principle, one that will help each of us to be steadfast and immovable as we move into ever more troublesome days ahead: “We do not take counsel from our fears.” (see Robert L. Millet, I Will Fear No Evil, 18). Prophets repeatedly have emphasized the truth that our faith in the Lord can and will replace our fears. Joseph Smith declared, “We have nothing to fear if we are faithful.” I want to repeat this simple teaching for emphasis, “We have nothing to fear if we are faithful” (Joseph Smith, The Personal Writing of Joseph Smith, 319). President Howard W. Hunter explained, “If our lives are centered in Christ, nothing can go permanently wrong. I am aware that life presents many challenges, but with the help of the Lord, we need not fear. If our lives and our faith are centered on Jesus Christ and his restored gospel, nothing can ever go permanently wrong. On the other hand, if our lives are not centered on the Savior and his teachings, no other success can ever be permanently right” (Howard W. Hunter, The Teachings of Howard W. Hunter, edited by Clyde J. Williams, 40). President Gordon B. Hinckley testified, “We suffer from the fear of ridicule, the fear of failure, the fear of loneliness, the fear of ignorance. Some fear the present, some the future. Some carry a burden of sin and would give almost anything to unshackle themselves from that burden, but fear to change their lives. Let us recognize that fear comes not of God, but rather that this gnawing, destructive element comes from the adversary of truth and righteousness. Fear is the antithesis of faith. It is corrosive in its effects, even deadly. “‘For God hath not given us the spirit of fear; but of power, and of love, and of a sound mind’ (2 Timothy 1:7). These principles are the great antidotes to the fears that rob us of our strength and sometimes knock us down to defeat. They give us power. “What power? The power of the gospel, the power of truth, the power of faith, the power of the priesthood” (Gordon B. Hinckley, Faith: The Essence of True Religion, 13-14). Our living prophet, President Thomas S. Monson, counseled, “Though the storm clouds may gather, though the rains may pour down upon us, our knowledge of the gospel and our love of our Heavenly Father and of our Savior will comfort and sustain us and bring joy to our hearts as we walk uprightly and keep the commandments. There will be nothing in this world that can defeat us…Fear not. Be of good cheer. The future is as bright as your faith” (“Be of Good Cheer,” Ensign, May 2009, 92). I was interested to learn recently about some of the things many young people your age most fear. In a survey completed by 1100 respondents between the ages of 16 and 25, money issues, underachieving, loneliness, and war were ranked as four of the top five fears (YouthNet). I especially was struck by the finding that one in five young people feared being alone—both now and in the future. I equally was impressed as I reflected on how the gospel of Jesus Christ provides the perfect remedy for our greatest fears. In a world where so many fear being alone, how blessed we are as we honor our covenants and keep the commandments to have the constant companionship— the companionship—of the Holy Ghost. The Savior reassured His disciples, “I will go before your face. I will be on your right hand and on your left, and my Spirit shall be in your hearts, and mine angels round about you, to bear you up” (D&C 84:88). My beloved young brothers and sisters, we are never alone. If we are faithful we need not fear—and we absolutely never need to fear being alone. (“How Firm a Foundation,” Hymns, no. 85). I know and witness Jesus Christ is our Savior and that He lives. Jesus is the only Begotten Son of the Eternal Father. He is resurrected and stands at the head of His Church and directs its affairs in these latter days. As His servant and in the authority of the Holy Apostleship, I invoke this blessing upon you—that as you face your future, your faith in Christ will overcome your fear, and that you will know with increasing certainty that He is with you. I promise that the Savior will go before your face, will be on your right hand and on your left, and that His Spirit shall be in your hearts in all of your righteous endeavors and throughout all the days of your life. I invoke this blessing upon you, and I bear my solemn witness of these truths in the sacred name of the Lord Jesus Christ, amen.